Stephanie Arnheim is Portland’s Networking Expert! She is also the Executive Managing Director of the Portland Chapter of eWomen Network. I’ve been a member of eWomen Network for a couple of years and it was probably the best networking group I have ever joined! The quality of women at eWomen is phenomenal and I’ve made some great friends there. I was a member of the Leadership Team and volunteered as their graphic designer. After working with Stephanie on eWomen projects for a couple of months, she asked if I could help her with some projects for Stephanie Connects – her networking business. I’ve designed some flyers for her events and most recently I designed a really fun postcard for her to use at networking events, along with some event banners to use on facebook. Stephanie knows just about everyone in Portland and she’s a natural connector. 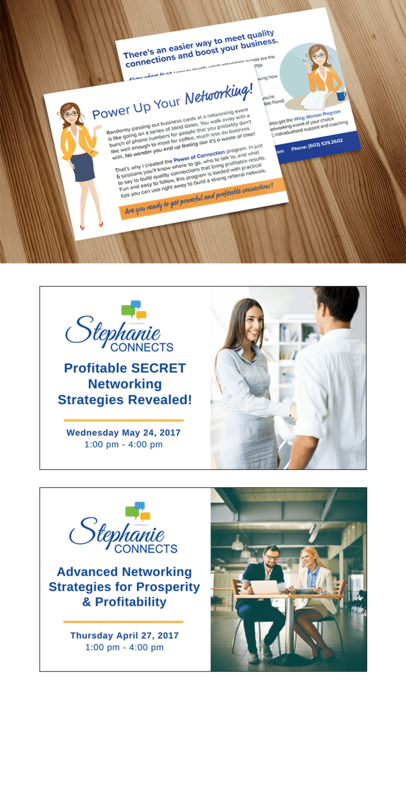 If you’re looking for networking tips and tricks, or looking for a great networking group, be sure to contact Stephanie – she’ll point you in the right direction!